To tell you the truth, I didn’t know that Estonia was a country. That is until we briefly visited there on the first leg of our 36-day cruise. We had heard so many good things about Estonia from people who had previously visited. I was so looking forward to visiting their favorite Nordic country! When we arrived it was raining and I had a feeling that the rain would prevent us from walking around at our own pace and leisurely enjoying the city of Tallinn. We hired a taxi that would take us on a city tour. We tried to avoid the rain and all the tourist busses but that was not happening this day. There was not much we could see in the short time we had. We wove through the old city cobblestone streets to the panoramic view of the City and saw the little Old Dude that we’d heard about from the Cruise Director's talk about Tallinn. This was my favorite story from Estonia that I bring home with me. It goes this way... Toomas was a peasant boy who could fire a mean crossbow…competitively. Because he was a peasant, (a plebeian! ), he was not able to receive a REAL prize because of his lowly status. So his reward was the job of guarding the town of Tallinn FOR LIFE. Wow. What a prize. Now Toomas (Thomas in English) was a kind man, giving candy to the children in the Town Square. And they really missed him when he died. So the lore was borne, mainly because of the uncomfortableness of answering questions about death to small people who would only ask more questions. 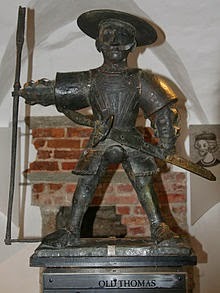 It was decided to make Toomas a permanent guardian of the city by placing him in weather vane form over the Town Square. Once the weather vane was put on the spire of the Town Hall, parents would point to heaven and tell the children that yes, there he is and Old Thomas was watching how they behave and may just leave them candy under their pillow if they were good. And Vana Toomas is now a weather vane, still guarding the city. He is there, twirling and predicting the wind and weather while he guards the city. This picture proves it.